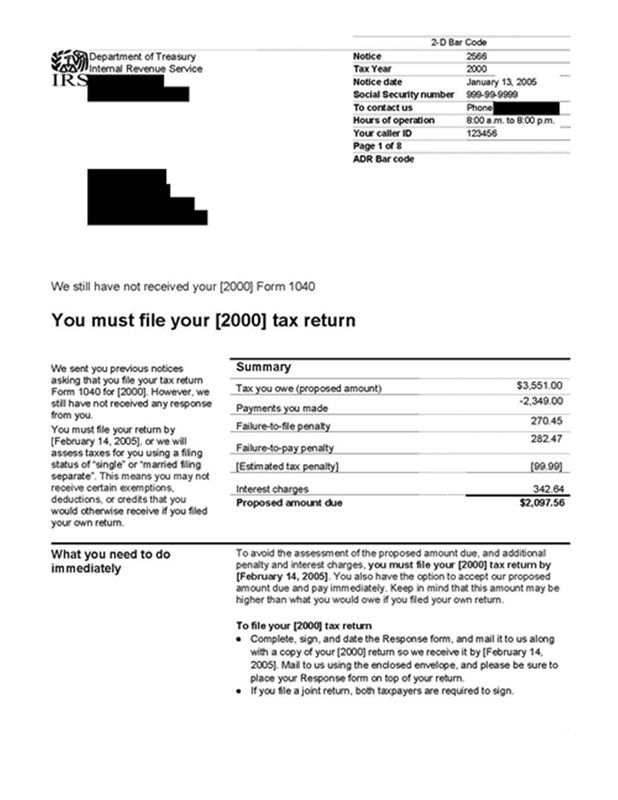 Letter 2566 is a very dangerous letter to receive from the IRS. Because you haven't responded to any of the previous IRS notices, they will determine your tax, without any deductions. If you don't respond to this letter they will send you a Letter 3219, Notice of Deficiency. However, this usually does not involve an examination of your deductions but rather an increase in your income by the items listed in the Letter 2566. This is not technically an audit but because the next IRS Letter will be a Notice of Deficiency, the proof necessary to win your case must be gathered & arranged in the same manner. Since there have been no assessments, you still have time to resolve your case. Don't panic and rush to file! First, look at the issues stated on the Letter 2566. Usually, the IRS claims you made more income or you are not entitled to a filing status or dependency exemptions. TaxHelpLaw needs to discover the IRS file, determine what filings should be made, prepare those filings, review any statute of limitations issues and if everything is adequate, resolve your case through normal channels. These are usually easy cases and you should not have to Appeal. But, over-reacting will cost you! Sometimes people have misplaced or lost records they need to prepare returns. However, the attorneys at TaxHelpLaw are masters are reconstructing records! Please follow the TaxHelpLaw Lost Documents Prep Steps. Our goal is the truth! If you owe the IRS pay it immediately to avoid high penalties and interest - even if you have to borrow. If the IRS puts a lien on you a loan will be nearly impossible to obtain. But, if you can't pay, please follow the TaxHelpLaw Collections Prep Steps and contact Mr. Hopkins!